I found a small parcel of land to lease for the 2019 season. My plan for this season is to stay small so that I can get accustomed to the Eastern Shore’s growing season. I will be growing a wide range of seedlings for the home gardener and in the field I will have tomatoes, pumpkins, winter squash, gourds, and heirloom popcorn. It has been cold and windy here, the perfect weather for staying inside to plan out the growing season. 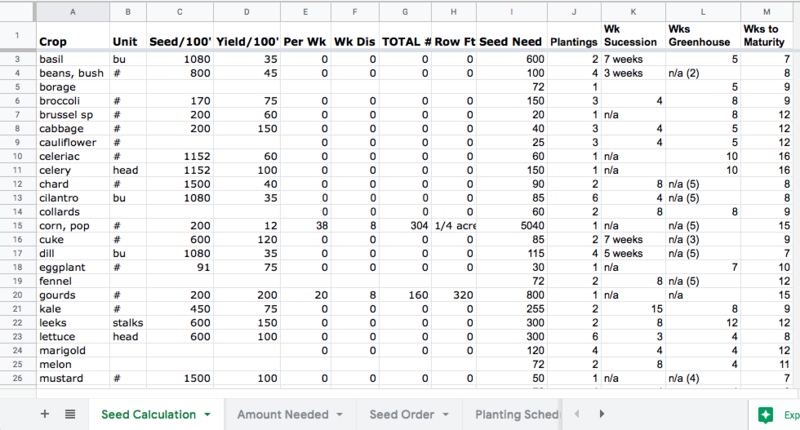 I use a series of spreadsheets to turn my ideas into a workable crop plan. The first spreadsheet is used for seed calculation. I make a list of the crops I want to grow and how much I would like to harvest each week. This allows me to figure out exactly how many seeds I need, then I add an extra 20% to cover poor germination and more importantly human error. The second spreadsheet is the seed order. 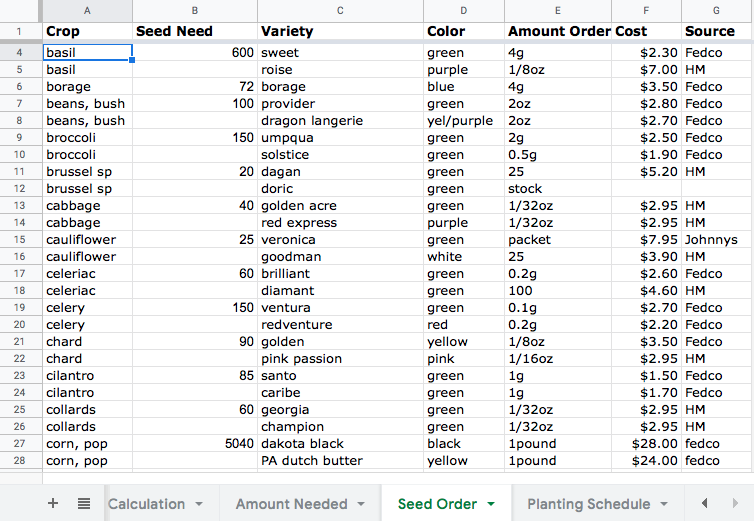 I take the crop and seed need columns then I break down which varieties I want of each crop, what seed company I will purchase it from, and the amount of seed I need to order (every company is different some sell by the individual number of seeds, some sell in grams, ounces, pounds, etc.). I just placed all my seed orders last week. I will continue to grow many heirloom varieties but this year I will be trying some hybrid varieties that have disease and pest resistance. Also I will be experimenting with three grafted tomatoes varieties. The third spreadsheet is the planting schedule. I take the crop, the variety, and seed need columns from the seed order spreadsheet into this one. Then I add a column for seeding date, transplant date, and first harvest date. 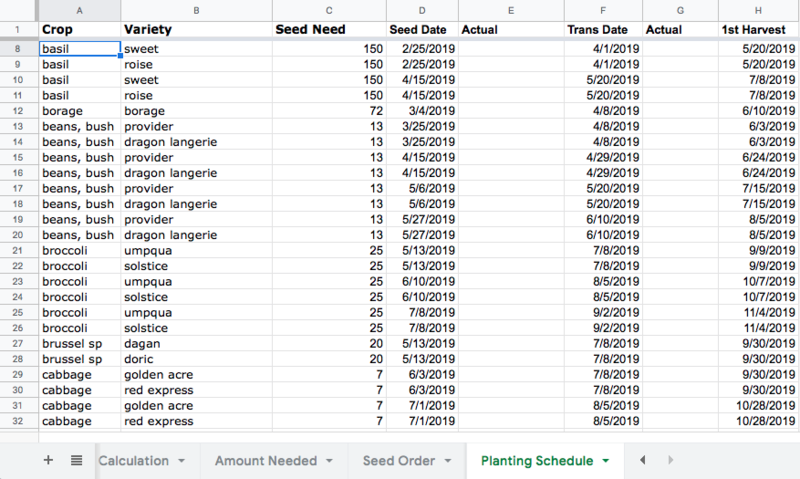 The planting schedule is the spreadsheet that I will be using almost everyday to know which seeds need to be started or transplanted. So I add two columns to write in the actual date for seeding and transplanting. This spreadsheet takes the most time as you have to cross reference a calendar and take into consideration frost dates, desired harvest, and/ or market outlets. Making a crop plan requires that you know where you will be marketing your crops. I am applying to a local farmers market. As this is my first year growing in Maryland I know that it is possible I will run into more challenges than I normally do in the field. This could result in low yields or unexpected delays in harvest dates. I feel a farmers market is a great venue when you are unsure of what you will have ready when and at what amount. The next task on my ever growing to-do list is getting the greenhouse set up and gathering supplies for starting seeds.